Who would you be if you lived in a magical land of dragons, trolls and unicorns? Would you battle dangerous creatures as a brave knight or would you rather cast spells as a wise wizard? If you prefer to be a rogue imp and get up to all sorts of mischief, then that’s on the table too! 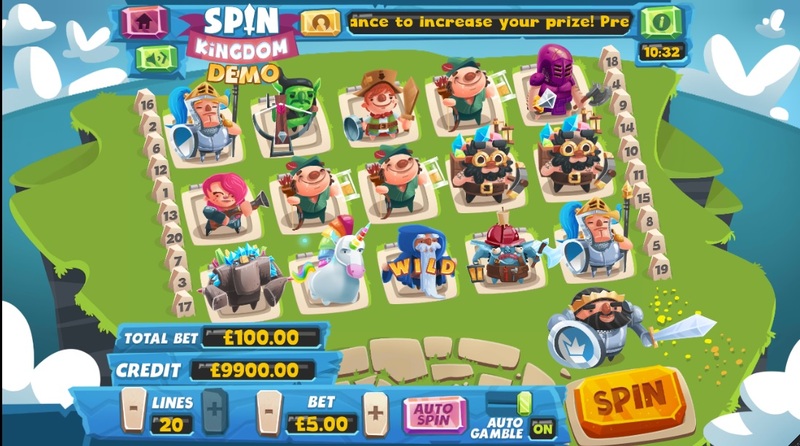 In mFortune’s new slot, Spin Kingdom, you can choose your hero and spin your way to glory, in whatever form that you please. There’s lots of fun to be had, multiple mini games to partake in and a prized jackpot prize to hunt! Ahead, the most fantastical, magical slot game ever produced by mFortune Casino. The Spin Kingdom reels are set up using the standard 3x5 configuration. However, the characters on the reels are not traditional at all. The slot reels are inhabited by many meticulously designed characters. There are unicorns with rainbow-coloured manes and little goblins carrying sacks full of coloured gems; pompous knights with their polished armour and pink-haired punk soldier. The Wild symbol is a wandering wizard. There is not a boring J, Q or K slot symbol in sight! There are 20 winlines in Spin Kingdom. You can choose how many to play with at a time, as well as how much you’d like to stake per line. The game accepts bets from as low as 2p per line up to £10 per payline. For example, if you choose to play 10 winlines at 10p each, you’d be wagering a total of £1 per spin. Feel free to toggle these settings with the arrow buttons until you find a bet level and game pace that you’re comfortable with. Spin Kingdom is another one of mFortune’s famous progressive jackpot games. This casino is well-known for setting aside a portion of every single wager made on the site. These funds contribute to the slot’s jackpot prize pool. The more the slot is played, the larger the jackpot fund grows, until it is eventually won by one of mFortune’s very own players! mFortune’s jackpots typically climb to the four-figure range before it is won. In other words, the jackpots are triggered quite frequently and you could very well be the next lucky bloke! There is also a gamble round that you can participate in after every winning combination on the reels. This game is a simple Wheel of Fortune-type game, in which you stand about 40-50% chance of increasing your winnings! Your chosen character swings his sword at the jumbo Gamble wheel; you’ll pick up whatever multiplier that his sword lands on. The game is designed like those Farm Frenzy-type mobile slot games (the types where players plant vegetables in little plots of land and move pieces around based on some intelligent strategy). In Spin Kingdom, each character occupies a little block on the reels. Similar characters are stronger together, and pay well too. The animation and accompanying music also adds to the magical quality of this slot game. This kind of production is usually reserved for premium mobile games that you have to pay for on the app store, so it’s really refreshing to see these resources dedicated to slot games that you can download for free. 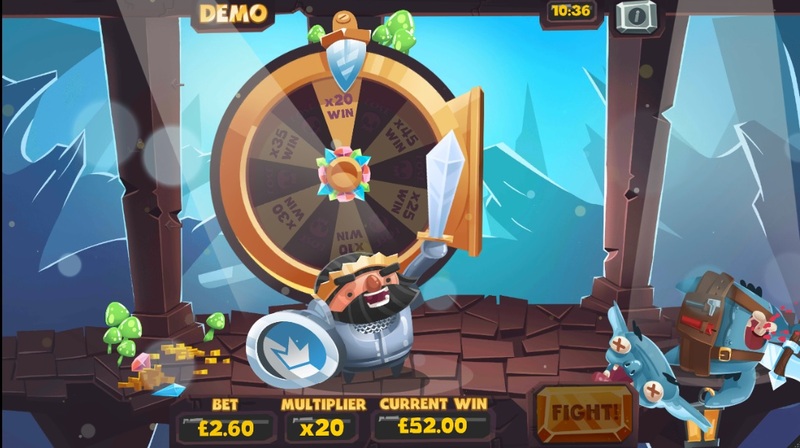 Game Features: Mega Multipliers, Extra Spins! What does one do in the magical land of Spin Kingdom? Explore new lands and defeat evil creatures, of course! After all, it’s the typical story arc of any fantasy story. mFortune Casino writes its own adventures in two mini games — Cash Clash and Dragon Trail. To play Cash Clash, you’ll need to score two or more Orc symbols anywhere on the reels. The Dragon Trail mini game is triggered when you score two or more Goblin Ranger symbols on the reels. In Cash Clash, you face up to three terrifying enemies. Select your difficulty level – easy, medium or hard – before you step up to the plate/spin the wheel of fortune. ‘Easy’ bags you wins up to 150 times while the reward for conquering the ‘hard’ level is a well-deserved 500x multiplier! If your arrow lands on ‘Win’, you get to collect that multiplier and move on to the next enemy. You can battle up to three times and keep the multiplier for each enemy that you defeat. However, if you lose a battle, the mini-game ends and you’ll leave with whatever prizes you have won up to that point. In Dragon Trail, you’ll brave the treacherous lands and fiery dragons to collect a mega multiplier. You’ll begin by pressing spin; the wheel will dictate how many steps your hero takes in the round. You’ll win every multiplier that your hero stops on. These multipliers are cumulative and you are free to gather as many as you can on your path to the treasure. The ultimate aim of the Dragon Trail mini game is to get to the dragon’s cave at the end. This cave holds more than 150x your wager, which is a stunning prize for any fortune-seeker! However, if you land on one of the many red skulls along the way, the game ends. This mini game is triggered quite often, so you’ll have many chances at scoring the big prize. Spin Kingdom (as well as all of mFortune’s slot games) is available on 99% of all mobile devices. The casino prides itself on creating slot games for every single mobile player on earth, regardless of the type of device he or she uses, or even the age of the device. The game is packed into a light app that you can download from the mFortune’s website. 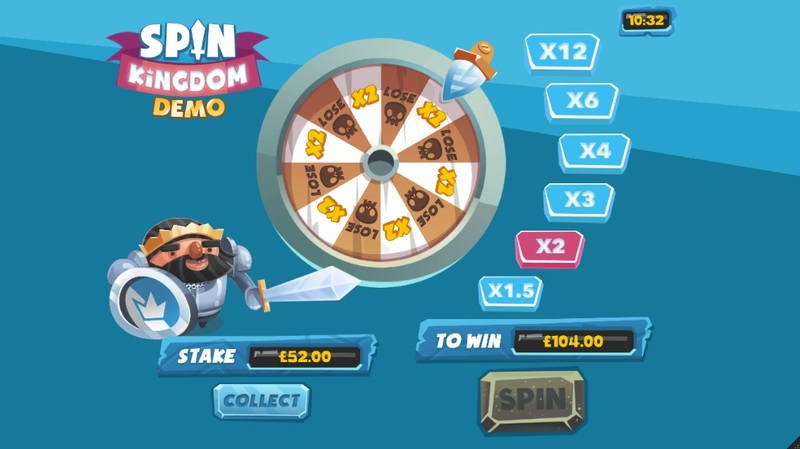 You could either play Spin Kingdom’s demo version for free or amp up the fun factor and play with real money! The app also accepts mobile phone deposits from as low as £3 (if you choose to deposit by phone bill) or £5 (if you choose to deposit by debit/credit card). You could easily pop small change into your mFortune account and start playing immediately. It’s bound to brighten up any dreary evening. Want to play Spin Kingdom? Embark on an adventure with Spin Kingdom mobile slot by mFortune Casino. Start playing with a £5 free bonus! Spin Kingdom Spin Kingdom is the one fantasy game that is right up my alley. I love the characters in this slot and I love the fun detours into the two mini games, each of which are like a complete gambling game on its own. The underlying gaming algorithm also peppers the base game with a good amount of hits and payouts, which makes the game really thrilling for any slot player. New players, listen up! Sign up today and receive a free £5 no deposit bonus from mFortune. 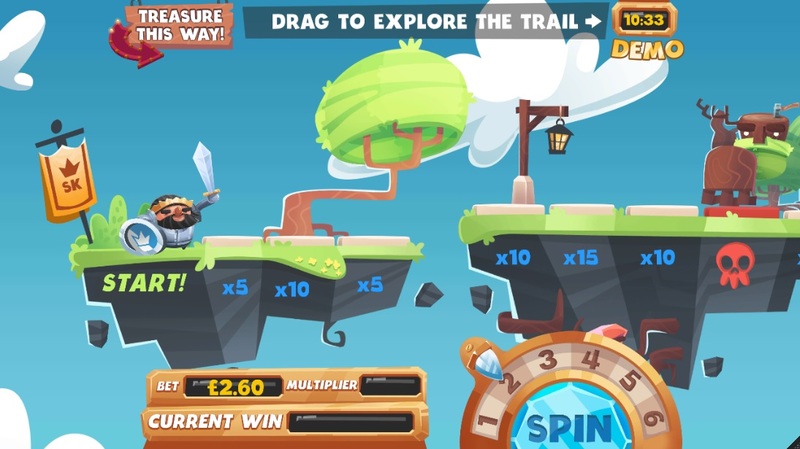 You could basically play many, many rounds of Spin Kingdom, for free! Even better, you can keep (and withdraw) everything that you win, as mFortune’s bonuses are completely free of wagering requirements. On top of that, mFortune Casino matches your first deposit, up to £100.